Car accident statistics in school zones have dropped over the last 20 years. While this is great news, there are still an alarming rate of pedestrian deaths in school zones. According to studies done by Safe Kids Worldwide, in 2015, 284 teenagers between 12–19 were killed while walking. That is over five pedestrian deaths every week. The attorneys at Parke Gordon Law Firm would like to remind everyone to be safe while driving around children. 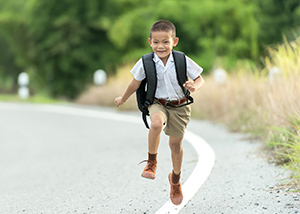 When approaching a school zone or park, be sure to drive cautiously and keep an eye out for children. In Washington, the speed limit in a school zone and park area is 20 miles per hour. Obeying this speed limit and remaining cautious when driving around children will help to ensure that children walking to and from school, and playing near parks, will be safe. RCW 46.61.440: Maximum speed limit when passing school or playground crosswalks—Penalty, disposition of proceeds. Subject to RCW 61.400(1), and except in those instances where a lower maximum lawful speed is provided by this chapter or otherwise, it shall be unlawful for the operator of any vehicle to operate the same at a speed in excess of twenty miles per hour when operating any vehicle upon a highway either inside or outside an incorporated city or town when passing any marked school or playground crosswalk when such marked crosswalk is fully posted with standard school speed limit signs or standard playground speed limit signs. The speed zone at the crosswalk shall extend three hundred feet in either direction from the marked crosswalk. A county or incorporated city or town may create a school or playground speed zone on a highway bordering a marked school or playground, in which zone it is unlawful for a person to operate a vehicle at a speed in excess of twenty miles per hour. The school or playground speed zone may extend three hundred feet from the border of the school or playground property; however, the speed zone may only include area consistent with active school or playground use. A person found to have committed any infraction relating to speed restrictions within a school or playground speed zone shall be assessed a monetary penalty equal to twice the penalty assessed under RCW 63.110. This penalty may not be waived, reduced, or suspended. School districts may erect signs that comply with the uniform state standards adopted and designated by the department of transportation under RCW 36.030, informing motorists of the increased monetary penalties assessed for violations of RCW 46.61.235,46.61.245, or 46.61.261within a school, playground, or crosswalk speed zone created under subsection (1) or (2) of this section. The school zone safety account is created in the custody of the state treasurer. Fifty percent of the moneys collected under subsection (3) of this section and the moneys collected under RCW 61.235(5), 46.61.245(2), or 46.61.261(2) shall be deposited into the account. Expenditures from the account may be used only by the Washington traffic safety commission solely to fund projects in local communities to improve school zone safety, pupil transportation safety, and student safety in school bus loading and unloading areas. Only the director of the traffic safety commission or the director’s designee may authorize expenditures from the account. The account is subject to allotment procedures under chapter 43.88RCW, but no appropriation is required for expenditures until July 1, 1999, after which date moneys in the account may be spent only after appropriation. Talk with a personal injury lawyer during a free consultation at Parke Gordon Law Firm about your case. Our experienced and knowledgeable attorneys have obtained impressive settlements for Spokane clients. Call our Spokane law office today at (509) 482-7274 today to discuss your case with a personal injury attorney for free.